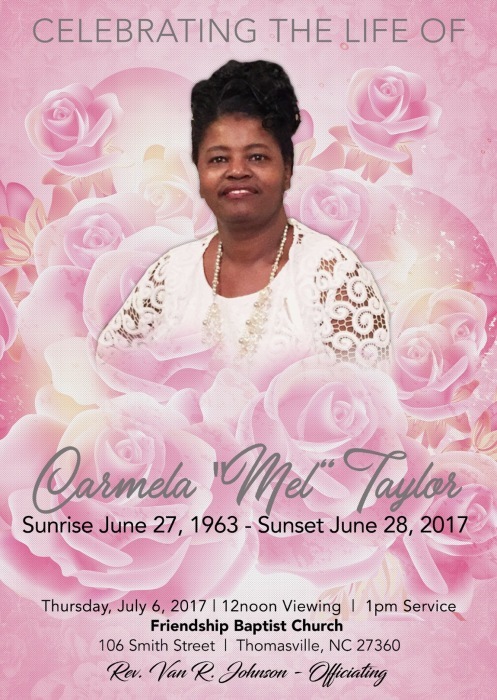 On Wednesday, June 28, 2017 Carmela Chaney Taylor, most affectionately known as “Mel” traded this earthy life for her new place in glory at her home at 210 James Crossing, Thomasville, North Carolina. She was fifty-four years young. Life’s journey for Mel began on Thursday, June 27, 1963 in Thomasville, North Carolina. She was born to Dorothy Chaney Dean and the late William R. Chaney. She attended the public schools in Davidson County and she graduated from Thomasville High School with the Class of 1981. She was last employed as an folder with Slain Hosiery. She was married to her child-hood sweetheart Dewaine Taylor, who survives of the home, for thirty-two years. She and Dewaine first met during the middle school years growing up in the “projects”. She would tell anyone who would listen that Dewaine was going to be her husband. Some called it “puppy-love” but Dewaine and Mel withstood the test of time, while married for thirty-two years, they were together as one for over forty years. From that union came her most prized possession their son Dewaine Taylor Jr., her two Dewaine’s were the light of her heart. She was fierce in her love for them, as they for her. 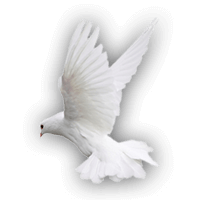 Mel was a faithful long-time active member of Union Baptist Church where she sang on the Union Baptist Gospel Choir and served as a young adult usher. Mel accepted Christ early in life. Her favorite songs were “I’m gonna be Ready” and “Put a Praise on it”. Mel was a caring person who loved life and her family. She had a beautiful soul. Her pastimes include watching Lifetime Movies, dancing and playing the lottery (she loved her scratch-offs). Her favorite color was red. Whenever you saw Mel she always had a smile on her face and what a beautiful smile it was. All who knew her, loved her. She was preceded in death by her father William R. Chaney and a very special niece India A. Gannaway. She leaves to cherish loving memories her loving devoted husband Dewaine Taylor of the home; an only child, Dewaine Taylor Jr.; her mother Dorothy Dean (June) of Oxon Hill MD; one brother Anthony Kinard; one sister Cassandra Denise Chaney Gannaway (Gary) of Thomasville, NC; one special niece Miracle Gannaway of Thomasville NC; three step-brothers Michael Dean (Natasha) of Clinton MD, Timothy Dean of Largo MD, and Delbert Dean of Washington DC; three god children Wanetta Tuttle, Greg Ray Jr., and Antoine Simon all of Thomasville NC; and host of nieces, nephews, cousins, in-laws, other relatives and friends.